This month is the time to remember all those from our circle of family and friends who are no longer with us - Memorial Day. We used to call it Decoration Day because we went to the cemetery to decorate their graves. The veterans organizations whould put flags out to remember those who have fought for our country. The flags are still placed in the cemeteries but there are not so many flowers. This holiday like so many others is now more just that - a holiday from work and a time to relax with our families. That's good. However, I think we miss out on a lot by not carrying out some of the traditional celebrations. Parades that are held on this day do not attract so many marchers or those on sidewalks. I guess it is a sign of the times. We seem to be in so much of a hurry that we are missing many important things. Everywhere people are saying how things have changed, and not for the better. You almost never see anyone remove their hats or place thier hands over their hearts when the flag passes by. You see fewer and fewer people taking time from their busy lives to participate in activities. We say we want to do things as a family, but we don't. Everyone seems to be going their own way- alone. There are many organizations that have had great ideals that are no longer in existence or just about gone. How many of you remember the Odd Fellows? They have no local unit now in our area. 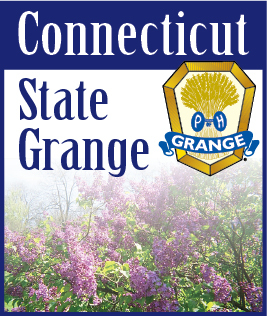 How many of you remember your Grange? When was the last time you attended a meeting or brought someone with you? There are many changes taking place in our world, the Granges, our lives. So this month as we celebrate Memorial Day I would urge you to take time out and together as a family to go to the local parade. Honor those that have fought for our country and have died. Honor those that are keeping tradition alive in your town. Help your children and grandchildren to understand what this day is all about. There will be time to sit down as a family and enjoy the day.